A landlocked mountainous country in Eurasia, Armenia is is bordered by Turkey, Georgia, the Nagorno-Karabakh Republic, Iran, Azerbaijan, and the Azerbaijani exclave of Nakhchivan. The official flag of Armenia was adopted on August 24, 1990. The Armenian Flag consists of three horizontal bands of equal width, red on the top, blue in the middle, and orange on the bottom. Armenia's oldest known inhabitants were the Hayasa-Azzi tribes who lived in the Armenian Highlands. These tribes formed part of the Nairi tribal union which settled in the region until 13th century BC. The first significant state of Armenia was the Kingdom of Ararat, also known as Urartu during the 11th century BC. The kingdom lasted until 7th century BC, with subsequent kingdoms in the region including the Ervanduni Dynasty and the Achaemenian Iran. 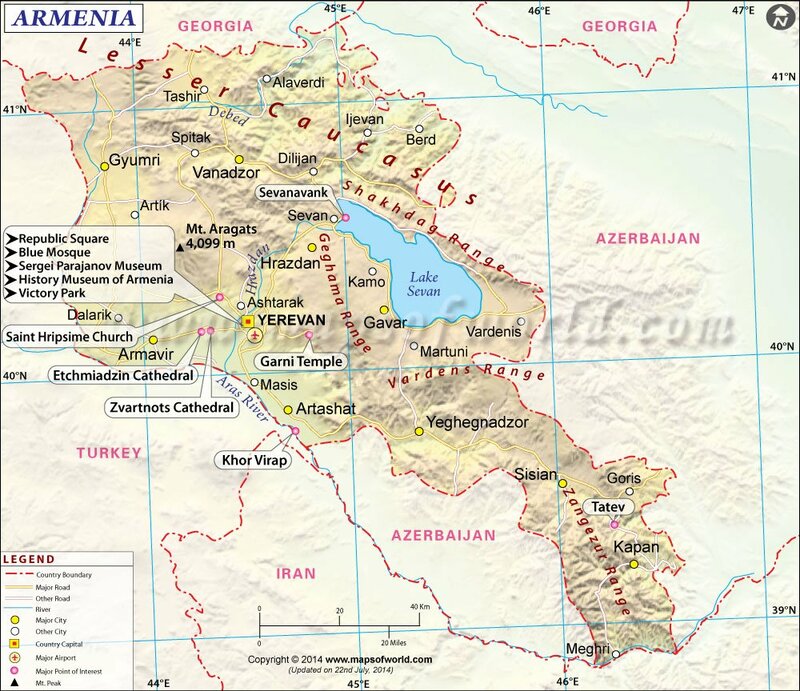 In 189 BC, Greater Armenia was formed and became the 3rd largest empire in the Near East. The kingdom lasted for the next 600 years. It was 301 AD when Armenia became the world's first ever Christian nation, when they adopted Christianity as the state religion. The rule of the Armenian kingdoms ended during the Seljuq conquest. The Seljuq were responsible for the first Armenian diaspora in the 11th century. Subsequent invasions included those of the Byzantine empire, the Persian, and the Islamic empires. Re-establishment of the Armenian kingdom occurred in 1375 in Cilicia. Armenia was then conquered by both the Ottoman Empire and Russia. During the First World War, Ottoman Turkey became suspicious of the Christian Armenia's loyalty to Russia, and therefore planned a complete elimination of all Armenians from the region. Killings and forced evacuations started taking place in 1915 - which marked the modern world's first recorded genocide. About 1.5 million Armenians died between 1915 to 1918, while others were forced to leave their homeland and march through the desert to what is now known as Syria. In 1920, the Soviet Union invaded and by 1922, Armenia became part of the USSR. Upon the fall of the Soviet Union, Armenia declared independence on Sept. 21, 1991. 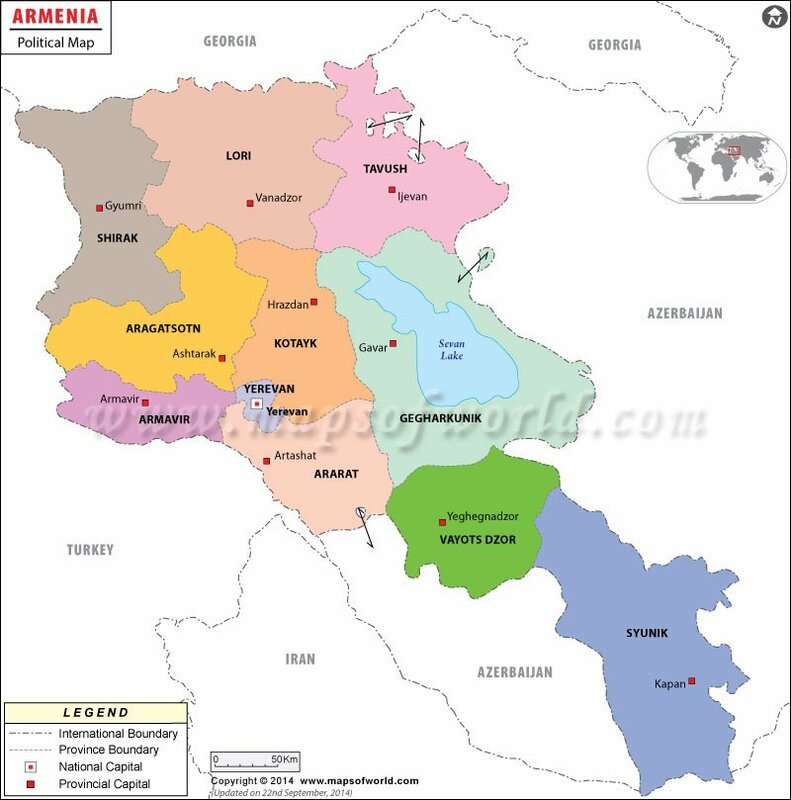 Armenia is a landlocked country located on the Western part of Asia and the Eastern part of Europe. Its borders are Georgia to the north, Iran to the south, Azerbaijan to the east, and Turkey to the west. Armenia is a mountainous country but its land is fairly fertile. A system of lakes and rivers also provide the landscape with enough sources of water for agriculture. Armenia works in the framework of a presidential representative democratic republic. The President is Head of Government and head of a multi-party system. Executive power is exercised by the government and Legislative power is exercised by both the government and the Parliament. The National Assembly makes up the country's unicameral parliament. Armenia is a member of over 40 international organizations such as the United Nations, the Asian Development Bank, the Council of Europe, the Commonwealth of Independent States, and many others. Tourism plays a significant part of the country's economy but traveling in Armenia is not the easiest. English is not widely spoken and it's also not the easiest country to reach. Despite these obstacles, millions of tourists still find themselves visiting this country of ancient churches, monasteries, and plenty of hidden treasures. Mount Atarat is the country's highest peak and considered to be the mountain where the biblical Noah landed his ark. Tourists can see magnificent views of the mountain from the Khor Virap Monastery - a 17th century church with a history of its own. Yerevan is Armenia's capital and home to plenty of architectural and religious treasures. It is also called "Pink City," for its pink-colored buildings and its flamboyant youth culture. Among the famous attractions in the city are the Etchmiadzin Cathedral and the Garni Temple. The Cathedral is the oldest state-built church in the world, said to have been built from 301-303. The Garni Temple can be reached from the capital and considered to be the world's oldest and best preserved Pagan temple. Around the temple is a fortress with ancient structures amidst a picturesque mountainside environment. Other popular tourist destinations in Armenia are the Dilijan - a popular forest resort nicknamed "Little Switzerland"; Jermuk, famous for its mineral waters; and Tsaghkadzor - a popular ski destination. Education is free and compulsory in Armenia for children aged 6-16. There are 3 levels of mandatory education in the country, which are elementary, basic school, and high school. Pre-school is the first entry to education but it is not required and many children do not attend it due to a number of reasons such as limited availability of schools. Education is highly valued in Armenia but the country faces many challenges in terms of scarcity of educational resources and specialists. The Ararat Valley contains an underground natural lake. There are over 11 million Armenians in the world but only 3 million live in Armenia. The rest live all over the world, with the United States having the largest Armenian population. Armenians claim to have the best tasting apricots, as well as the best cognac.